Crash Course Astronomy: Episode 1. Welcome to Crash Course Astronomy! 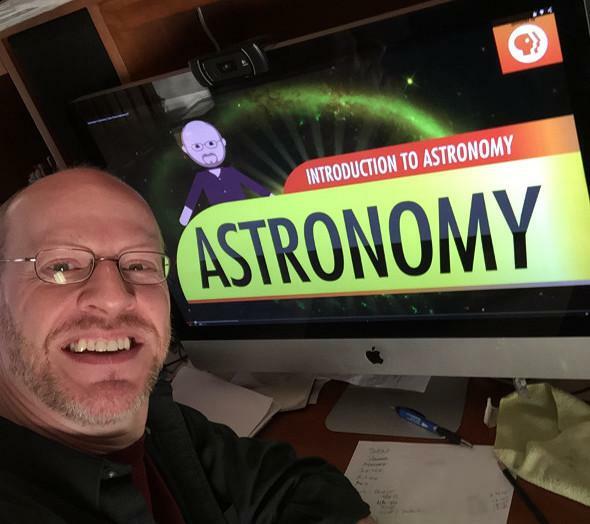 It is my pleasure to introduce you to the very first episode of my new online video series, Crash Course Astronomy. I’m not gonna lie to you: I’m pretty happy about this. It was a lot of fun to write, and a lot of fun to film it. I hope y’all like it. We have a lot more episodes planned, going from naked-eye astronomy (hubba hubba), through the solar system, out to the stars, to the galaxies and the Universe itself. There’s a lot of stuff out there, so there’s a lot of cosmos to cover. Hey, I’m on my own computer! And allow me to indulge myself for a sec here. I’m really excited about this series. I’ve wanted to do something like this for years, but lacked the resources to do it myself (also, I’d rather pull my own head off than edit video). Working with the Crash Course team has been fantastic. They’re dedicated, talented, smart, fun, curious—pretty much all the characteristics I like to see in human beings. And the thing is: They’re honestly excited and motivated to work on these series (which also include SciShow and Sexplanations). Visiting Montana to film these episodes is like pure fuel for the brain; seeing everyone work so diligently makes me want to work harder to make better content. So my sincere thanks to Hank and John Green, and to the folks who work on my show: Blake de Pastino, Nicholas Jenkins and Michael Aranda, Nicole Sweeney, and of course my dear friend Dr. Michelle Thaller, who has been essential in helping me not forget to mention obvious stuff in the videos (and correcting me when—rarely, of course—I’m totally off base). Thanks also to Derek Muller of Veritasium for being there at the very start, and to the folks at Thought Café, who make the adorable videos, including me as, apparently, a Canadian from South Park. * And of course, thanks to PBS Digital Studios for making this all possible (read this to see how). And don’t forget to subscribe to Crash Course on YouTube! You can also support us on Subbable if you’d like. But mostly, just thanks for watching. I was pleased to find I learned things writing these episodes. I hope you do too. *Update, Jan. 16 at 22:00 UTC: Somehow Derek Muller originally didn’t get listed in my thanks to folks, so I added him.